Matt the collie stikes again. 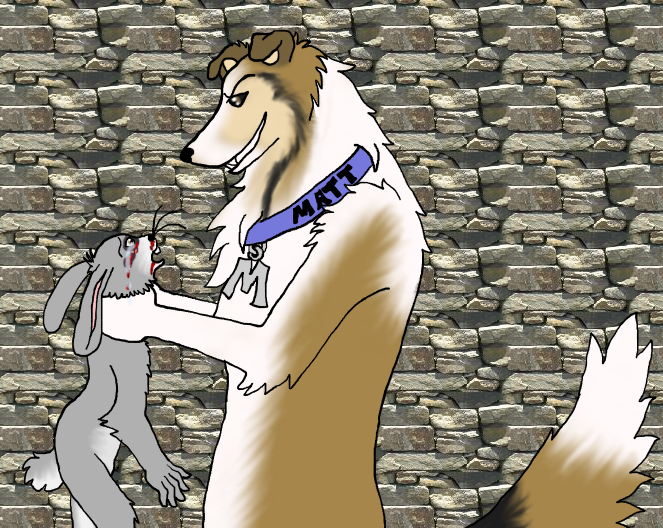 Matt the collie and a random bunny have an altercation. Bunny vs collie, the dog always wins. This started out as a joke between me and some friends on Sofurry, we got talking about Greyhounds chasing rabbits and I said a collie wouldn't waste its time chasing something it didn't need to, their much too smart for that and would probably wait for it to stop running first (In this case I think Matt the collie smacked the rabbit around a bit first before holding up his prize). Drawn for me by a friend. Only I and my friend have permission to use this. Rabbit goes in the stew pot. Rabbit goes in the stew pot. Thanks for the comment. I agree, he would end up in Matt's belly. I agree, he would end up in Matt's belly. Thanks for the fave. Now what fate do he have in plan for the bunny?